In a profession that demands strong leadership at the helm – perhaps much like a ship’s captain – it might seem that a kitchen with two head chefs, each with the distinct and strong personalities that cooking demands, would be navigating rough waters and eventually end up on the rocks. But in Lance Edwards and Jammie Monk, the restaurant at Puddicombe House in New Hamburg has co-chefs who work together. Edwards has been with Puddicombe for eight years, while Monk, formerly of Rushes Restaurant and the Waterloo Inn, came on board in October, 2016. A series of restaurant connections drew the two together to run the food and beverage program at Puddicombe. “In our looking for staff, Jammie’s name came up. He was interested in the cooking arrangement, so it happened,” says Edwards. Truth be told, there’s more than enough work to go around with the opening of Puddicombe’s large banquet centre last year. Still, it was a bit of an experiment says the man who put the team together, Puddicombe partner and general manager Nick Cressman. Initially, he too was curious as to how they would work together. “I wasn’t quite sure what I’d done, but the system has worked well,” says Cressman. One example is an evolution of a humble sandwich. A popular scone that Edwards had been making was re-configured with the addition of Monk’s recipe for pastrami. “People love these biscuits and with the pastrami recipe, we take a bit of my idea and a bit of his idea, tweak it and we have an even better dish,” Edwards says. 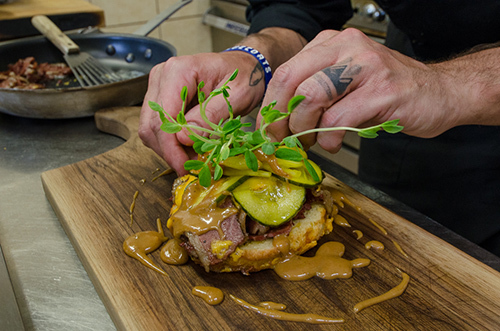 The result is a house-made Chicago-style aged Cheddar biscuit with house-cured pastrami, a sweet and sour pickle and a drizzle of dulce de leche. They can’t really describe the exact style of the food they cook – perhaps it lies somewhere between fine dining and casual, suggests Monk. Edwards says they enjoy Asian flavours as well as Indian and at the time this article was being written, Puddicombe was running an Italian tasting menu. “We cook from the heart,” Edwards says. “And we’re versatile,” adds Monk. 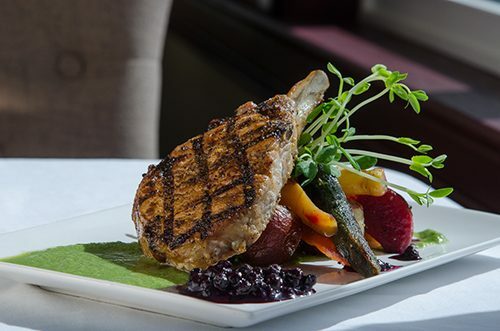 During the hurly-burly of a lunch or dinner service in the 60-seat restaurant, essentially the rooms of the 1868 vintage house, one room more casual than the others, both chefs prepare the dishes. However, when the hurly-burly of the wedding season is at full throttle, Monk runs that kitchen while Edwards sees to the restaurant cooking. They cross-over and help out each other. Pan-seared scallops from the Puddicombe kitchen sit atop a Caribbean-inspired carrot-mango sauce with pickled cucumber noodles and house-cured pancetta garnished with candied sage. It’s eclectic and draws on a couple of techniques and cuisines. Standards like Caesar salad are tweaked with baby Romaine, a bacon-jam crostini and egg gremolata to become a playful bit of food history: the Caesar “Cardini” Salad, named for the chef and the mythic origins of the Caesar salad in Tijuana, Mexico. They also smoke 10-ounces of succulent pork chop with a garlic scape-maple essence and serve it with a sweet pea puree and a wild blueberry-whiskey compote. It just seems to say “Waterloo County fare” but with a twist. The building’s architecture is an homage to the original Puddicombe house (which also includes a bed-and-breakfast and a spa). Roughly 5,500 sq-ft. of banquet space can be divided into two rooms with a total area that is licensed for 360 people. The centre is playing its role in the growing food and restaurant scene in Wilmot Township with Jake & Humphreys across the street (and its own pair of chefs), MeMe’s Café and the Scran and Dram pub with their new food operation – a market and eatery scheduled to open this spring – going into the refurbished Imperial building which also features the Bitte Schön Brauhaus brewery. That collaboration is the key, both chefs agree. More and more, culinary operations in Waterloo Region – whether it is chefs working together during events or pairings of restaurants and beverage companies – are seeing increased teamwork. It’s an energy that Edwards and Monk use to characterize their cooking that has resulted in smooth sailing so far.